One of the stunning changes in retail over the last few years has been the rise of DIY engineering, mechanics and electronics products available directly from Chinese manufacturers through eBay. We’re talking parts that used to cost literally ten times as much – and often require ‘special ordering’ that meant they took forever to arrive. So let’s take a look at some cheap and readily available electronic modules that can be easily integrated into your automotive modification. Each of the covered items has been bought and extensively tested – they’re all good ones! How often would a red/green indicator of car battery voltage be useful? Lots of times, yes? Well, now there’s a cheap pre-built answer – green for OK, red for replace (or charge) the battery. The tiny PCB is just 30 x 17 x 10mm and uses a single red/green LED. 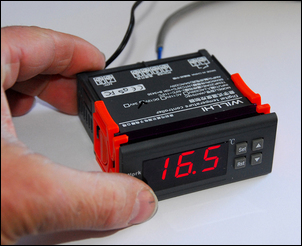 A multi-turn pot allows you to adjust the changeover voltage to be anywhere from 6.5 – 30V, so it’s ideal for monitoring car battery voltage. The module has a hysteresis of about 0.2V. Above the set point it will show green, at the set point both the green and red parts of the LED are lit, and below the set point the LED shows red. Search on eBay under ‘Battery low voltage warning module Adjustable Lithium NiMH NiCD ion phosphate’. The module will cost you about AUD$5, delivered to your letter box. 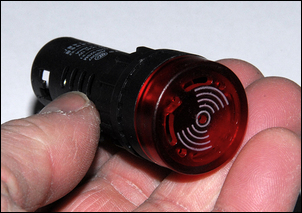 Here’s a 12V warning light that incorporates an audible alarm. Connect 12V (either polarity) and the two LEDs will flash and the high-pitched buzzer will sound. It’s ideal for oil pressure, low coolant level and similar ‘must know’ indications. Note that when first triggered, the light and buzzer will be activated for a longer initial period (to get your attention), and then the follow-up flashes and sound are quicker. The killer advantage is the price – around AUD$8 for five of these units, again with post included. Search under “5x DC 12V 22mm Red LED Power Indicator Light Signal with Buzzer”. Here’s an adjustable output voltage regulator. It’s an ideal replacement in older cars that use a regulator to run the coolant temp and fuel gauges, or in a more modern application where you need a regulated 5V for powering a sensor. 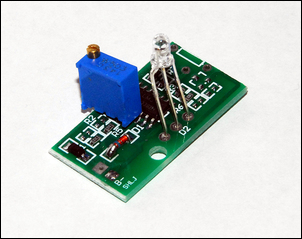 The adjustable LM317 pre-built board is available for just over AUD$2, post included. (Or do as I did, and buy five of them to put on the shelf – just AUD$7 total!). The LM317 is rated at up to 1.5A output, but depending on the required voltage drop, will probably require a heatsink to achieve this. It’s happy working with an output range of 1.25 to 37V, but remember that the input voltage will always need to be about 3V higher than the required output. The board is clearly marked with solder pads for input and output, and the multi-turn pot allows fine adjustment of the output voltage. To find the module, search under ‘Low Ripple Buck Linear Regulated Power Supply LM317 Module’. Need to operate something for a period at the press of a button? It doesn’t get much cheaper or easier than this! Available now on eBay for just AUD$14 (including delivery) is this general purpose 12V timer. Search under “Adjustable Delay Timer Module”. The module is adjustable for periods from 1 second to 3 minutes, comes with an on-board relay capable of running devices drawing up to 10 amps, is fully built and easy to wire into place. Here’s a great off-the-shelf module that can be used in ‘serious’ applications like security, or to simply trigger a light when movement is detected – easier than installing a switch in an older car’s boot or glovebox! The module comprises a small board 45 x 30mm. The sensor, mounted on its own 15mm square board, comes supplied with about 150mm of cable and is fitted with a plug. A matching socket is provided on the main board, so connecting the two requires simply plugging the sensor into the socket. 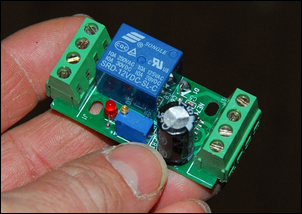 The output is provided by an on-board relay that’s nominally rated at 20A. However, the board tracks would not cope at all well with this much current, so perhaps don’t load it with more than an amp or so. Also provided is an on-board pot. This does not, as you might first expect, adjust the sensor sensitivity but instead alters the time the output stays energised after the sensor has last detected movement. This output is variable in the range 15 seconds to 30 minutes. Note that clockwise = shorter duration. 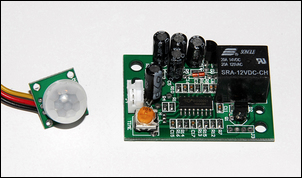 You can find this AUD$8 module by searching under “DC 12V PIR sensor High sensitivity PIR Module with Relay control”. You want to control a radiator fan – and at the same time monitor coolant temp with an LED display? Or operate a water/air intercooler pump on the basis of measured intake air temp? 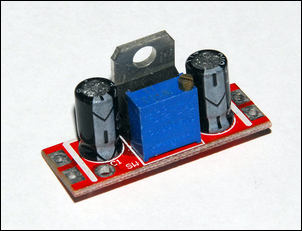 Well here is an incredibly cheap 12V module that will allow you to do that – and a host of other things besides. How cheap? Try under AUD$14 delivered to your letterbox. To find it, search on eBay under “DC 12V Digital Temperature Controller Thermostat C”. The module uses a LED display that shows temps up to 100 degrees C to one decimal place (e.g. 35.6), and above 100 degrees C in single units (e.g. 105). The update rate is fast (about 3 times a second) and the sensor is very responsive to changes in temperature. Despite the price, the module isn’t at all cheap and nasty – in appearance it could easily be an expensive instrument…. and that sentiment also applies to the internal build quality. Here’s something a bit different – a standalone module that gives you loudness, bass, treble and balance controls. It’s perfect where you just want to play MP3 files off your phone. Just plug your phone into this module and then connect the module to an amplifier. 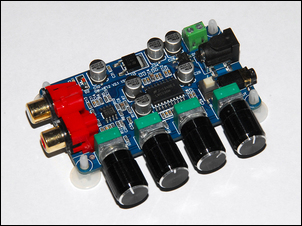 On eBay, search under “LM1036 + NE5532 Stereo Preamp Preamplifier Treble/Bass Tone Board DIY Amplifier” to find it. It costs about AUD$4, post included! The output is via a 1/8th inch stereo socket and the input is via two RCA sockets. Power (12V) is supplied via either a DC-type socket or screw connectors (positive on the screw connectors is closest to the end of the board). As its name suggests, this board is based on the LM1036 tone control IC. The IC has low distortion and bass and treble are variable by a substantial plus/minus 15dB. The loudness button has a similar bass and treble boost, i.e. up to 15dB at low levels. However, this boost drops away nicely as the volume control is advanced. However, this module has one unfortunate glitch – if the loudness button is operated when the music is playing, a pop can occur in the speakers – best to set it then forget it. Don’t forget that you can just leave the volume control on the board set to full and then use your phone volume control to change level. So there you have it – seven electronic items that are incredibly cheap, will be delivered straight to your letterbox, and have immediate application in car modification.